Ocean Craft Marine is pleased to announce the development, testing and delivery of another OCM industry first; A 9.8 meter Rigid Hull Inflatable Amphibious boat. This new model Amphibious RHIB is no longer a prototype and has now entered full-production. This very first production boat is intended for private use, and is being delivered this month. 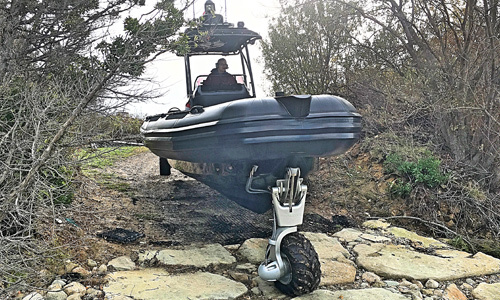 The Sealegs® amphibious system available on the OCM 9.8m RIB and consists of motorized, retractable and steerable wheels, powering the boat with tremendous off-water capabilities. The entire system is marinised and retracts completely out of the water while underway. This means there is no compromise to on-water performance. Once fitted with the amphibious technology Sealegs®, any OCM RHIB will be able to travel directly between land and sea by the use of three retractable wheels with a hydraulic system linked to an inboard motor. 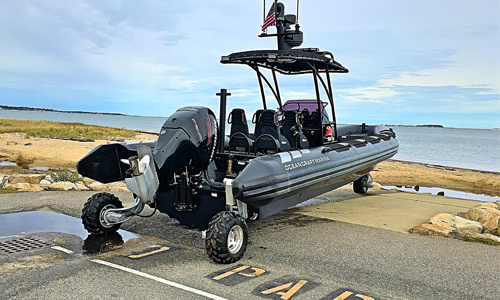 Powered by a single 350Hp Mercury, Verado 4 stroke outboard engine, this 9.8m amphibious RIB can reach speeds of up 41 mph when fully loaded. On land, it can travel to up to 10kph. Featuring Hypalon Tubes, 225 L fuel tank and self-draining deck, the OCM 9.8m is also equipped with 4 Ullman Patrol Shock-mitigating Seats designed for additional comfort and lateral stability. The stand-up double center console has a forward seat and the Canopy has a custom 4 sided Canvas/Isinglass seasonal cockpit enclosure that can be added to it. This boat was ordered fully in black color, for its fiberglass, tube-set and accessories; So all the stainless steel and aluminum equipment have been powder coated in black color, such as the aft tow post, the forward Samson post and the T-Top.